Home » Uncategories » 80 seats on the plane occupied by 80 falcons! 80 seats on the plane occupied by 80 falcons! A recent photo of the inside of an airplane leaked on the Internet and has become viral ever since. 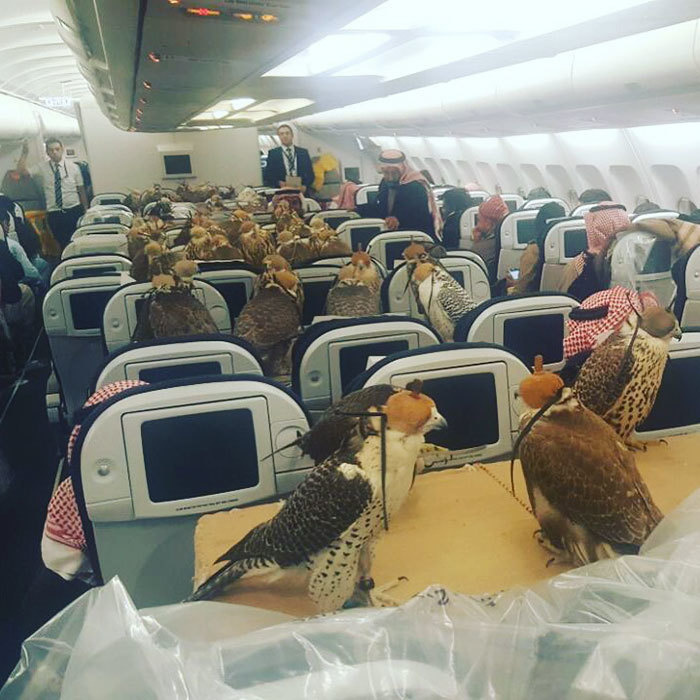 The photo showed 80 seats on the plane occupied by 80 falcons! It was an A330 plane on its way to Jeddah, a city in Saudi Arabia. Although this may seem bizarre to many of us, transporting falcons via plane is common for wealthy people in Arab countries. There are long-lived traditions of hunting falcons or using them for competitive sports. Several different airlines such as Etihad or Qatar charge an additional cost of up to $630 (depending on the destination) to board the plane with your falcon. And to top it off, the falcons even have their own passports! The idea of it all is kind of ironic — a bird who can transport itself in the sky riding in an airplane. But hey, these falcons are worth a lot of money so who are we to judge? Here's the original photo of the 80 birds onboard that was posted on Reddit. The caption of the photo read: "My captain friend sent me this photo. Saudi prince bought ticket for his 80 hawks."